Thomas Edisons desperate moves to junk AC of Tesla had spread in the United States during 1880’s. Inventor and business man Thomas Edison entered the lighting industry establishing the Edison Illuminating company on 1882 in New York City. The incandescent lamps he used were invented and patented by him also. He used an 110V direct current supply to power the high resistance lamps. Actually, the illuminating company he has was perfect to commercially promote his DC system. Edison’s direct current systems were sold to the United States and making it a standard wherein Edison himself controlled the key documents like technical development files and holding all the key patents. 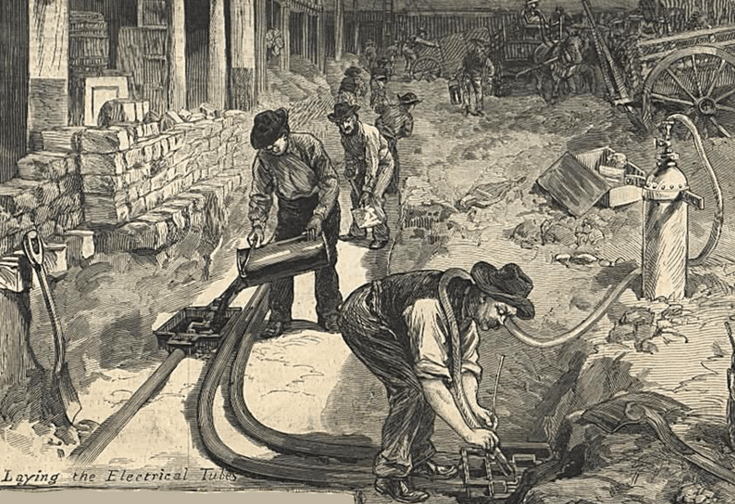 Installation of Edison’s DC System: Several men buried Edison’s DC power lines under the streets in New York City in 1882. Image is taken from Wikipedia. The primary disadvantage of the DC system of Edison is that it is limited only to a short distance. Edison’s DC system ran at 110V from the generation side to its final destination. Because of this the suitable location of the generating plant is on the middle of the population centers. It is almost impossible to supply a population of 1 mile away from the plant. Thomas Edisons dominance in the DC systems did not last that long due to the rise of AC as the serious competitor of DC. 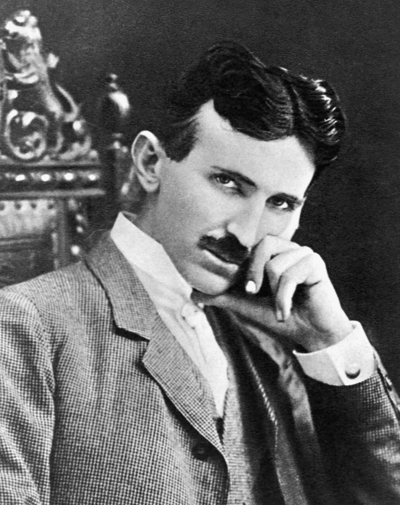 Nikola Tesla patented the idea of using AC as the power source. AC as the power source corrected the drawback and short coming of Edison’s DC system. With AC, the power plant is can be located very far from the user since voltage stepping up is possible using voltage transformers. Out of the fix power provided by the generating plant, the voltage is can be increased to kilo volts level. This results to a very small current travelling in the transmission lines. This corresponds to a small power loss in the transmission lines. Unlike Edison’s 110V DC source, the power loss on the wires is huge since a DC level is almost impossible to step up. A 110V DC will result to a relevant current level considering a fixed power compared to kilo volts level of voltage. Early Version of AC power plant to produce AC based power system. George Westinghouse an inventor and entrepreneur entered the electric lightning business in 1884 when he started to develop a DC system popularized and patented by Thomas Edison. He hired William Stanley Jr. to work on it. Westinghouse was aware of the limitation of DC system. He is aiming to increase his competitiveness in the lightning industry that is why he did not hesitate to adopt the European AC systems that is patented by Nikola Tesla as he saw in the UK technical journal. The AC system of Tesla is can be used to supply consumers miles away from the generating plant using transformers. He is more than aware that with the AC based system he can get the large market share in illumination industry. The battle between him and co-American Thomas Edison started. At the end of 1887, Westinghouse owned 68 alternating current power stations compared to Edison’s 121 DC systems. The arrival of AC in the United States alarmed Edison. His DC business is on stake and continuously losing revenue. 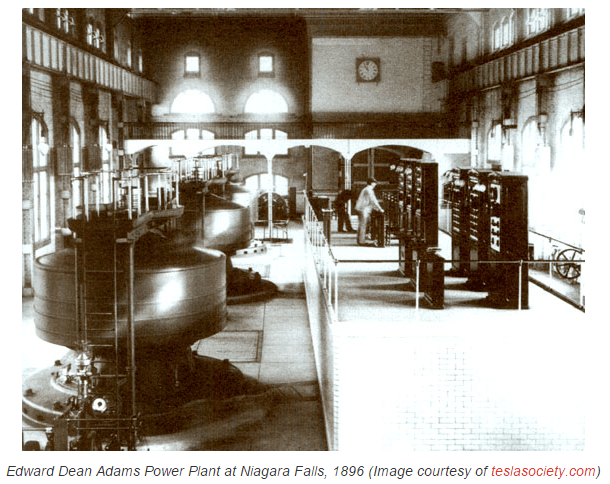 It is hard for Edison’s DC system to compete for the European AC system pioneered by Westinghouse in the United States. His low voltage DC system demands for larger copper wires to carry larger current. The price of copper continues to increase. Aside from this, his DC system is more lossy than Westinghouse AC. Edison is continuously losing bids in the municipalities and small cities. Edison is fully aware of what’s going on and keep on thinking ideas to junk AC from the minds of consumer. Actually, his men were about to buy the ideas of acquiring AC for the future of their company but Edison was hardly opposing the idea. First on the list of Edisons desperate moves to junk AC was to take advantage of the series of death incidents caused by electrocution related to AC powered street lighting. 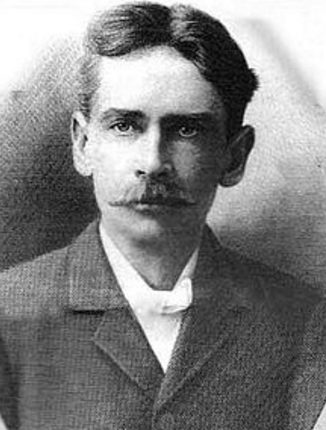 Harold Brown an anti-AC crusader who was seemed to be not related to Edison’s company was demonstrating how deadly the AC is by electrocuting a horse in Edison’s West Orange laboratory. Later on, Brown was exposed as Thomas Edison’s ally. 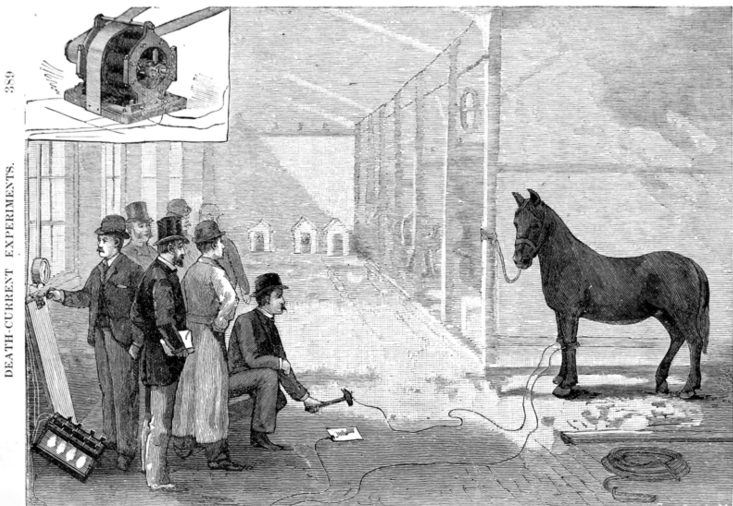 Harold Brown demonstrating the killing power of AC to the New York Medico-Legal Society by electrocuting a horse at Thomas Edison’s West Orange laboratory. Brown also paid local children to collect stray dogs in the streets for experiments on DC and AC electrocution. Brown electrocuted one of the dogs by a 1000 volt DC and the dog survived. He then applied 330 volts AC on the dog and killed the dog. Edison’s desperate moves to junk AC extended by discouraging the use of AC in the United States and influencing the decision of the state legislators and spread the wrong information about AC. Based on some reports, Harold Brown and Arthur Kennelly, both employees of Edison, designed the first electric chair for the state of New York that is AC powered. This is part of the campaign to make people realized that AC is more fatal than DC. Both Edison’s DC and Tesla’s AC are somehow co-existed. Tesla’s AC is became the standard for power transmission. Edison’s DC did not become out of place. AC voltage needs to be converted into DC in the consumer side.